Opening the front door to the aroma of a cake baking in the oven is one of the most pleasant homecomings imaginable. 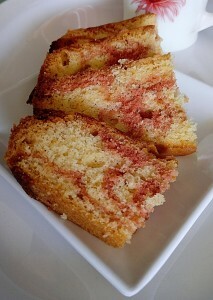 The classic marble cake is made of chocolate and vanilla; I choose to make a strawberry and vanilla marble cake. A classic tea time treat that you can have as is. 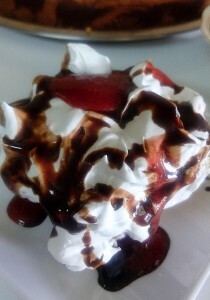 I choose to eat mine with whipped cream, chocolate and strawberry sauce!!! 1. Use a 12 inch round cake pan. Lightly grease and flour tin, tapping out any excess. Preheat oven to 180 degree centigrade. 2. Place butter and powdered sugar in a large mixing bowl; Beat until light and creamy. Add egg yolk one by one till incorporated. 3. Sieve maida, baking powder and salt. Stir into batter, a little at a time. 4. Beat egg white until stiff and fold into mixture. 5. Spoon 1/3 of the batter into another bowl, add strawberry pulp, color and mix well. 6. To the remaining batter add vanilla essence, mix well. 7. Spoon the vanilla batter into the prepared tin. Add the strawberry batter on top. Twist a fork through the layers of batter to produce a marbled effect. Bake for 40 to 50 minutes at 180 degree centigrade or until a cake tester (knife or toothpick) comes out clean. 8. Cool in the pan for 30 minutes, then move the cake onto a cooling rack and cool completely.